Products featuring Space Ducks comic and images. Small - $22.50Medium - $22.50Large - $22.50Extra Large - $22.502XLarge - $24.503XLarge - $25.50Youth LARGE (14-16) - $18.00Youth MEDIUM (10-12) - $18.00Youth SMALL (6-8) - $18.00Youth EXTRA SMALL (2-4) - $18.00 - On Sale! 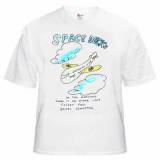 Image from one page of Daniel's new comic book SPACE DUCKS on white t-shirt. 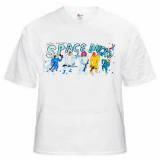 The official SPACE DUCKS t-shirt featuring the title and images from Daniel's new COMIC BOOK Space Ducks.